Imagine you moved to Khayelitsha, South-Africa’s largest township, in the late 1980s after about a decade working as primary school teacher. Imagine you are so overwhelmed by the sight of kids living on the streets, eating in dumps that you decide to take them in to feed them. Imagine the number of kids coming to eat at your house grows so much you call on neighbours to help. What will your impact be in a community with an estimated 14,000 street kids? Where will you find the strength and the means to take care of all the people in need, in this community affected and weakened by the HIV/AIDS epidemic? Today, I am inspired by Rosalie “Rosie” Mashale of South-Africa. Rosie, as she is called since childhood, was born in the late 1950s in a small village called Matatiele in Eastern Cape. She had a happy childhood, with a father working in the mines and her mother staying at home to look after Rosie and her three siblings. She describes her family as a loving home. Rosie trained as a teacher and care worker and worked in a local primary school. She had a very peaceful and quiet life in Eastern Cape, got married and had her a child, a daughter. She never expected her life to ever really change till, some 13 years working as a primary school teacher, she had to move to Khayelitsha. Her husband had been moved there to open a traffic department in the area. As she was had lived in the countryside all her life, she never expected there existed such a place. Khayelitsha is said to be South Africa’s largest township – home to one million people –, “a very poor place” as Rosie describes it, in the outskirts of the wealthy city of Cape Town. As other townships in South-Africa, Khayelitsha was also designated for Black Africans during the Apartheid era and to the date, it is dominantly inhabited by blacks. Rosie was surprised by the way people lived in the city. Everybody in the township was busy trying to make a living, many running small businesses and everyone in the community seemed to know one another and to be there for one another. Yet, in sharp contrast to that community spirit, the streets were filled with homeless kids. She could see them everywhere, rummaging through garbage to try and find food. Where were their parents, she wondered? She found out that most kids were orphans. For others, their parents were away during the day, either at work or in search of work. She immediately knew she had to do something. One day, not long after she had moved to Khayelitsha, she called the kids she saw by her house and brought them in to offer them food. "I called them in, and we sang rhymes, and I gave them bread and something to drink." When the parents returned, they thanked her and asked her to do same the following day. Before she knew it, she was doing it every day and her house turned into a de facto day-care centre! After the first week, she had 36 children to feed! She enrolled other women in the community to come and help her look after the kids. She chose the name Baphumelele for her project, a Xhosa word meaning “we have progressed”. “I opened the doors to take care of the orphans, for me it is a calling to do what I am doing”. Little did she realise what she was getting into. She was to find out later that the township has an estimated 14,000 orphans! After ten years of doing this, Rosie was forced to retire. Her doctor had advised her that her health was declining, and she should not continue to be surrounded by so much noise and excitement. It is with sadness that Mama Rosie closed her day-care in 1999 and prepared to lead a quieter life. But fate had other plans for her! On 21 November 2000 – she remembers the exact date – she found a child abandoned on her doorstep. She decided to go to the police to report it. As she was stepping out of the house, a police van stopped by her gate and a police agent brought her another child. It was a surreal situation: she had thought that the police could help her and instead, the police were asking her to help them out! Bye bye retirement!! From a day-care centre, Baphumelele had become an orphanage! It wasn’t long before the word spread, and kids were anonymously left at her footsteps. The local maternity hospital even called her at some point asking her to come and pick up two abandoned babies. By the end of the year 2000, Mama Rosie was caring for 67 children, all in her own little family home. "I didn't have the heart to turn anyone away. Young girls and boys and babies were in every part of my house. I made a deal with God, promising to look after these children if he promised to provide me with the resources to take care of these kids." Most of the children who are placed at Baphumelele had lost their parents to HIV/AIDS and a big number had been infected with HIV/AIDS themselves or had other illnesses, such as tuberculosis. There were also cases where the kids had suffered abuse. Rosie doesn’t just wait for kids to be brought to her, she also tours the community to try to find kids who need a safe place to stay. It is never easy to find kids living in the bushes or in dumps. With her savings, she brought a plot next to her house and an architect agreed to design the centre for free. She also learnt to write requests for funding and contact local and international organisation that could help her in this new life path. The response she received was overwhelmingly positive. Brace yourself, that is not all: the woman who was supposed to have retired since 1999 and was asked by her doctor to avoid noise and excitement also runs a soup kitchen. Rosie’s Kitchen, as her neighbours call it, prepare food for township people in need using unsold vegetables. received from various markets. The organisation also runs a small soap factory where people living who are HIV positive or are suffering from other chronic illnesses but who have the strength to work can have an opportunity to be productive and make a difference in society. As you can tell, Baphumelele has lived up to its name – ‘we have progressed’! And progressed they did: over the years Ma Rosie has become a real household name in South-Africa. You will not be surprise that her story attracted the attention of former south African president Nelson Mandela, who one day paid her a surprise visit. And if I tell you that she was visited by Beyoncé Knowles, Bono, Sir Elton John and the whole Manchester United Football team, you will think I am making it up! 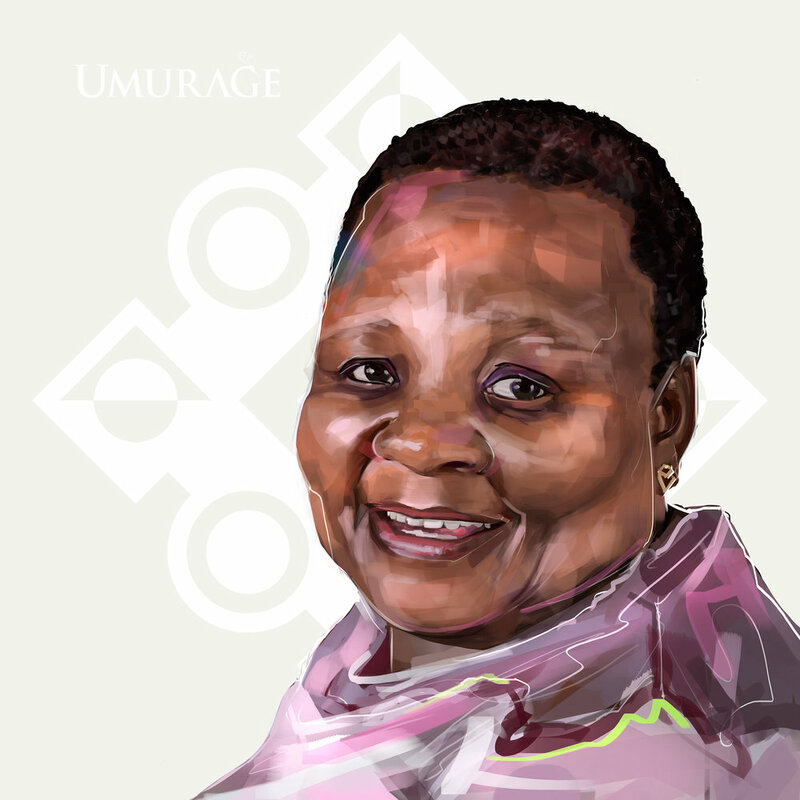 In her three decades running her organisation, Rosie Mashale has received about the same number of local and international awards as the years she has been operating Baphumelele. It wasn't an easy journey. Shortly after she started the orphanage, Rosie's husband died, leaving her alone with their daughter and a fast growing organisation to run. Yet, the widow continued her struggle to save kids from the streets. She also managed to raise her own child and put her in school all the way to university. Her daughter Rethabile is now thirty, has a family of her own and holds a PhD in social development. Looks like she is following on the footsteps of her illustrious Mother. Ok, maybe this could be a good time to retire. Certainly not, she will say. Maggy Barankitse of Burundi – Never give in, never give up!